have you been to Susan's blog yet? She always lets the sun shine! Olive oil and lemon juice on my salad. Lemon curd on biscuits and toast. 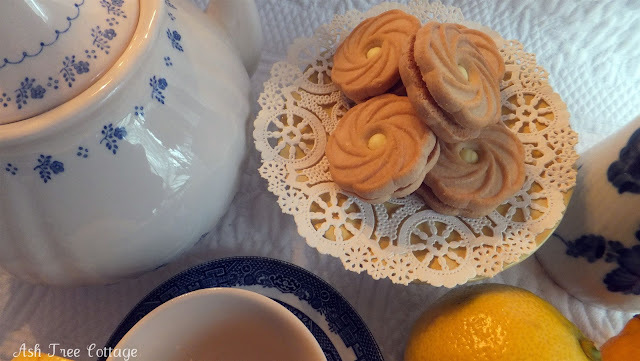 Lemon tarts and lemon bars. Lemons are sunny and yellow and make me happy! And lemon cookies too. Try one ~ they are yummy! Bentley ~ would you like a little slice of lemon in your water bowl? I like lemon cookies and lemon wedges in my water! Love the tablescapes!! I love lemon in my diet coke but hate it in water, is that strange? Yellow and blue.... Such a favorite of mine! I could just reach through the monitor and steal a flower! Lovely shots, Susan. So pretty! Love the tablescape! Can't beat the blue/white/yellow! I love everything lemony and lemon too. Pretty pics. You have set such a fresh and cheery tea! 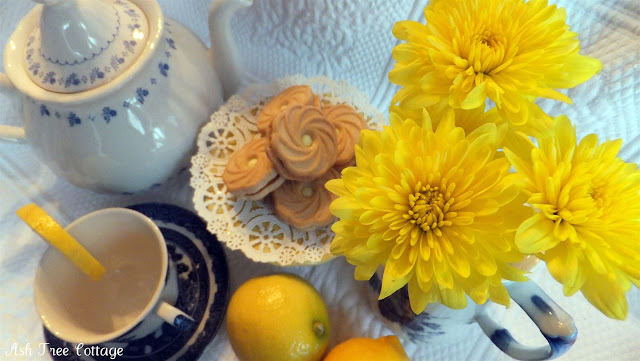 I love the blue and white tea cup, and your lovely choice of lemon for the theme. It all looks so inviting! Simply love your blue and whites with cheerful yellow. I simply had to "Pin" your photo! Oh my gosh this is sooooooo gorgeous and really and truly sunny. It is just so inviting and elegant. I can just taste those wonderful cookies. Thanks for partying with us! Love the blue and white and oh, those pops of yellow! I'd love to have you come link to Seasonal Sundays this Sunday. Lemons....love them! Love the color, love the taste, love the look, love the feeling of warmth & happiness they evoke...LOVE THEM!!! Very pretty, like a splash of sunshine! Your post just made me happy! Thanks....love the sunny side of you! Don't forget lemon pie and lemon squares!! And all on your beautiful blue and yellow table! Please place a link to Blue Monday on your post and return to link in again to Mr. Linky. You can find the code in my sidebar. We are such kindred spirits! 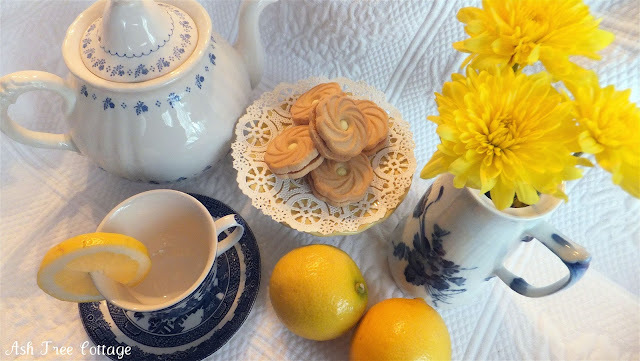 I love Susan Branch's blog, letting the sunshine in, lemon pasta and lemon meringue pie!! Bentley Has His Own Magazine! Why Is She Showing Us This? Hours to Cook ~ 10 Minutes to Eat! Is It Too Early To Be Dreaming Of Spring? What's On My Plate for 2012?